Hello again! We hope you're finding some moments of joy and delight amid the usual chaos of the holiday season. In today's post, we bring you a simple and fun activity to try with your children one night soon. This activity came to mind when thinking about some of the common Christmas lore such as Santa and "elf-on-a-shelf." Many parents struggle with the idea of lying to their children about these topics while still preserving the magic of the season. There have been a lot of great articles written on how to respectfully handle them such as this one, this one, and this one. At our house, we're probably using a combination of the three approaches, and it has been working well so far! OK, let's get started with today's activity! Step 1: Think of two things about yourself that are true. Step 2: Think of one thing that is not true about yourself. Step 3: Say all three of them to your child in random order. Step 3: Have your child try to guess which one of the three things is not true. Step 4: Now switch! Have your child take a turn and you guess. It's a really fun way to get to know each other a little bit better, and you may be surprised what you find out! 1) My favorite season is summer. 2) I had two German Shepherds when I was a child. 3) I have never been to Canada. Can you guess which one isn't true? We hope this activity brings you and your child closer together. And we'd love to hear from you! Did you discover anything about your child you didn't know? Did you remember something about yourself that you had forgotten? Leave a comment here or on Twitter or Facebook with some of your best ones! Happy holidays and...mind the nap! Welcome back, parents and kids! We hope you had a nice Thanksgiving and had a chance to reflect on what makes you feel grateful. This month is moving quickly and just like that, another holiday is upon us. Happy Hanukkah! When we think of Hanukkah, a couple of central images come to mind: menorahs and dreidels. For the menorah, maybe a little background is necessary, in case you're not that familiar with Hanukkah. 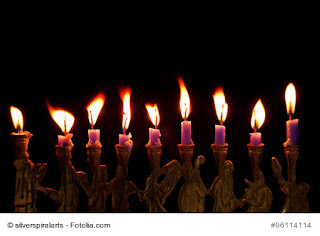 We light the menorah to commemorate the miracle that is said to have taken place in 165 B.C. during the re-dedication of the second temple of Jerusalem. As part of the ritual, they needed to burn a sacred oil each night, but they only had enough for one night, and they did not have the time to make more. However, the oil miraculously lasted for eight nights. But what if the oil did not last? The Jewish people would still have many holidays, to be sure. But there would probably not be a Hanukkah! Jewish children also play the dreidel game during Hanukkah. It's a game of chance. When they spin the dreidel, no one knows what side will land face up. What if you keep landing on Shin? What if you always get Gimel? Both of these things make us think about what if and that gave us the idea for tonight's activity. What if we had no car? What if people were smaller than insects? What if the earth ran out of oil? What if dogs/cats could talk? What if you could visit outer space? Feel free to try those or make up some of your own. We hope this sparks some fascinating conversations and gets your imagination in gear for some interesting dreams! We'd love to hear your What If questions. Please leave a comment here or on Twitter or Facebook with your best ones. We also wanted to take a moment to share this great calming bedtime activity from Jeff Bogle. It's a great idea and a perfect companion to other Moonlit Minds activities. OK! Go enjoy thinking about what ifs, and...Mind the nap!